I have been driving all over the state, picking strawberries, buying stuff at the thrift store, rearranging all of my living room furniture and working on something fun that will be posted elsewhere this week. I'll fill my blog back up with the large volume of content that has backed up in my brain over the next few days. Right now I am running on three hours of sleep. So that's all you get. But I really wanted to say hi anyway. Oooh. Yum. Those strawberries look delicious. Berries just taste better when you pick them yourself, don't you think? I want to make the world's biggest strawberry and spinach salad with those bad boys. 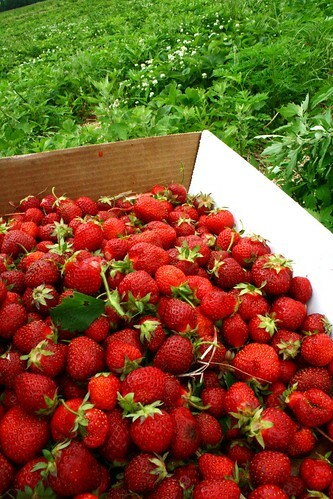 I just had a big bucket given to me by a friend- there's nothing like fresh strawberries! Oh boy those strawberries are making my mouth water! I'll read whatever you post if you share those strawberries! They look awesome. YUM, I love berry season! Lucky you! Well, maybe not the three hours of sleep, but the strawberries...yes! I love fresh strawberries!! !